Khao Manee is a cat breed from Thailand, though it may be new to North America and Europe. The name Khao Manee itself is a Thai name meaning white gem. It is also referred to as the Diamond eyed cat. It is a rare cat breed with an ancient history that dates hundreds of years. You will find the mention of this cat in cat book poems. The stand out feature of this cat is its eyes. One eye is blue and the other can be copper, yellow or green. This beautifully attractive cat breed is thought to have been the favorite of royalties. Khao Manee is a unique combination of various features, which includes a face that is heart shaped with cheekbones that are set high, nice white coat, along with ample of naughtiness. Khao Manee is an intelligent cat breed with the ability to entertain people. Khao Manee is a pretty new breed in the Western countries, but is very famous in their native country Thailand. This cat has joined the list of cat breed from Thailand, which includes the Korat, Siamese, and the Burmese. All the other cat breeds are well-known and have created a name for them in west, but Khao Manee is new to the western world and information about this cat breed is a secret in Thailand. The name of this cat has been mentioned in ancient Thai cat poems, but in these poems the name of this cat is mentioned as Khao Plort. The eyes mentioned here had the color of mercury. This eye color was altered to reflect theodd-eyed cats. 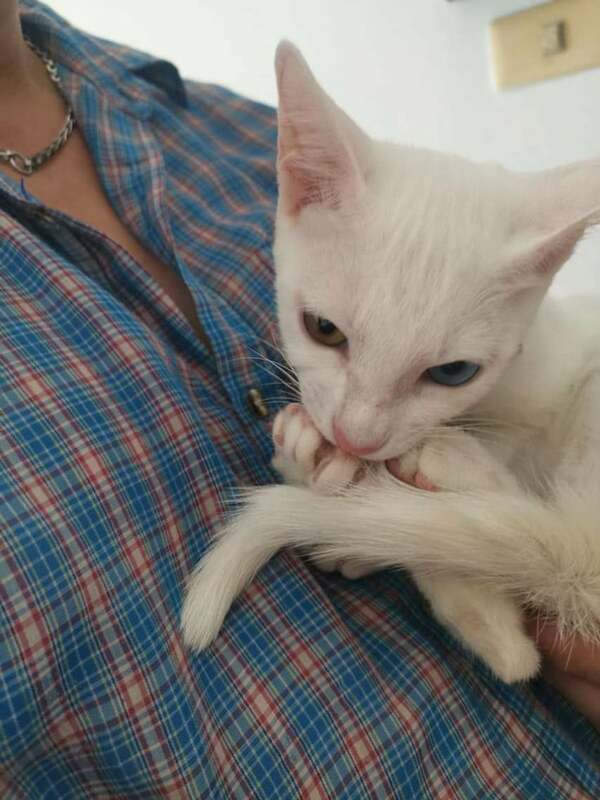 The odd-eyed cats were thought to be lucky. The yellow colored eyes are like diamonds from canary and were preferred by breeders. The interest for this cat started developing in the west and it was only in the year 1999 that Colleen Freymouth decided to import the very first Khao Manee from its native land Thailand to the American shores. Later, she imported a male cat too to America and used these both cats to breed. The first litter was born in the United States. 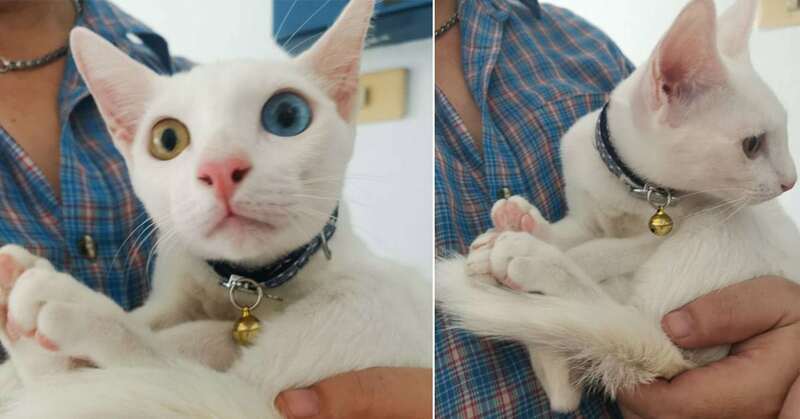 Breeders from the Odyssey cattery exported the first Khao Manee to Britain and the interest for this cat breed started gaining momentum in Europe and more breeders started importing more of these cats from Thailand to create and increase the breed. TICA accepted this cat only for registration in May 2009 and it was only in 2011 that this breed got complete recognition. In US this breed is still rare and cat registries from US have not recognized this breed. This Thai beauty has a heart shaped head with very high cheekbones. This overall face structure is a perfect setting for the beautiful jewel like eyes that is an important stand out feature of the Khao Manee. Khao Manee has an alert look always, due to their large and upright ears. This type of ear goes well with the curious nature of these cats. Most people prefer the odd-eyed cat in a Khao Manee with one eye blue and the other yellow. Sometimes the color of one eye can be blue and the other can range from yellow to green. Some may even have green or yellow eyes. 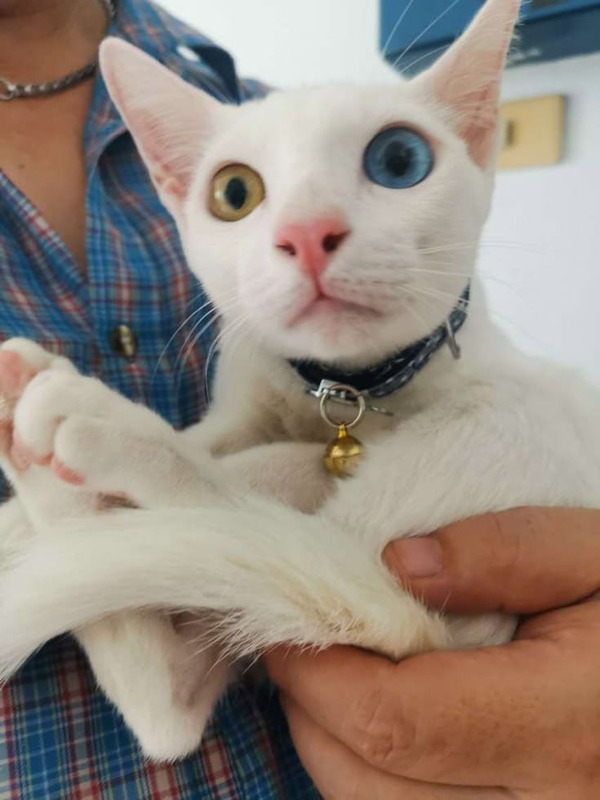 To match these colorful eyes this cat has pure white coat. Kittens with other color coat with all the above features can also be found in one litter. Males typically weigh around 8 to 12 pounds while females weigh around 6 to 8 pounds. The body structure of these cats is suitable for the tropical and hot weather condition. The medium size nose, medium sized body frame, short and smooth coat, and athletic and muscular body are all suitable for the conditions in the tropical areas. These cats do not have any undercoat, but possess a soft coat that is short to medium in size. The tail is long very similar to their body and tapers to the tip. Legs are medium to long and feet are oval and match with the body. The average lifespan of this cat is 10 to 12 years. The average price of this cat is $120. Khao Manee is active, fun loving, intelligent, outgoing, social, talkative, playful and warm natured cats. Their playful nature has a sense of naughtiness too. They are devoted animals and love welcoming people inside the house. They will gracefully greet people inside the house and when everyone is gone it will be glad to sit near you. Their muscular and flexible body frame is best suited for energetic games and for playing fetch. The coat of this cat is short, shiny and smooth. Their short coat requires very less grooming. They shed very little and hence require minimal grooming. Since this white beauty is a natural cat breed they have very few health issues. Deafness, which is common in white cats, is not of a big concern in this breed. Khao Manee will eat food meant for cats and that includes meat based foods rich in animal proteins, and commercial cat food. Since these are active cats you need to maintain a balance in their diet so that they stay active without growing obese. Khao Manee is very outgoing and friendly cats who love the company of its family members. These intelligent cats are easy to train and will learn tricks quickly. They love guests and children. These cats are party animals. This is one cat breed that insists on checking out every move of their owners and will follow them to toilets. They will even sleep with you on your bed if you allow them to. Khao Manee is best suited for families with children. They love the company of children and other pets in the house. If you are a single person, then it is ideal to get one more cat or else Khao Manee can get bored and lonely. They like to be involved in all the activities and are good people oriented cats. 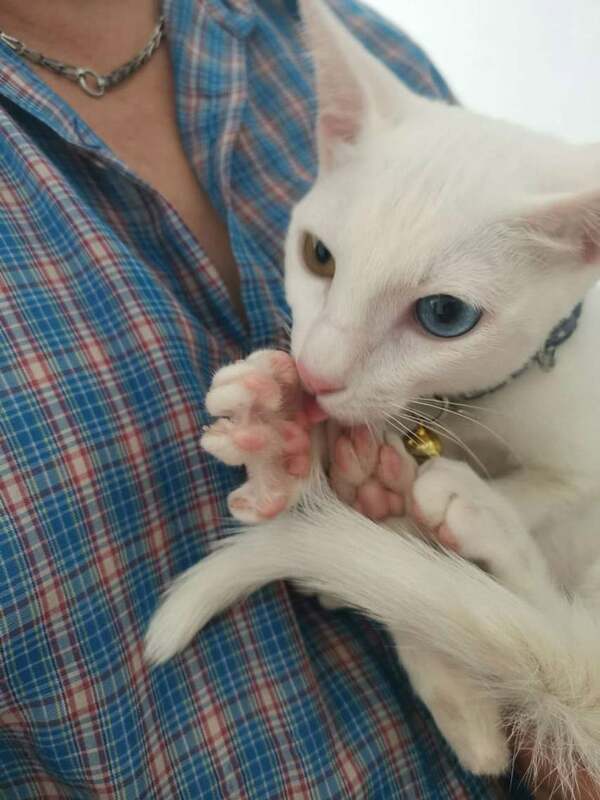 This pure white cat is low maintenance animal with very little grooming. The height of these cats can range between 10 to 12 inches. Previous articleWhy do Cats Cough up Hairballs?